One of the main tasks during codec's development and tuning is evaluation of compressed video quality and measurements' data management. We test and develop video codecs of different types and standards for more than 5 years. Some of our publicly available codecs comparison reports are located and can be freely downloaded from videocodecs comparison webpage. We are making commercial projects on codecs' testing and tuning and are interested in any possible projects in this area. x264 is a freeware codec of MPEG-4 AVC/H.264 standard. A number of codec comparisons including our own show that x264 currently is one of the best H.264 codecs. We made an analysis of x264 parameters. Results of performed analysis clearly show usecases of different codec's parameters. These results may be of interest to professional users of this codec and codec developers. 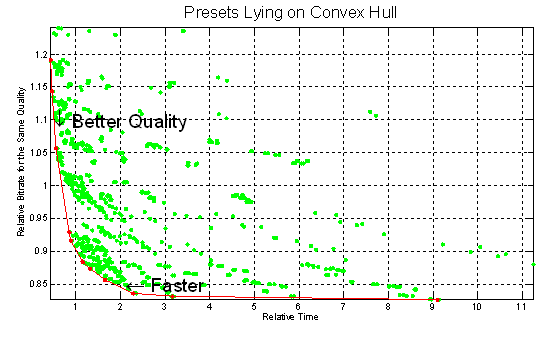 Also such results are of considerable help for codec's tuning and improvement. Comparison report freely available at our website. There are two versions of VQMT: free version for personal usage (reduced functionality) and commertional version for companies (all features are included). See VQMT page for more information. Main tasks of Video Codecs Scoring System (ViCoS) are analysis of video codecs performance based on objective video quality metrics. More information can be found at ViCoS System page.